The proud maiden -- Wearing her own glacier like a scarf, the Jungfrau rules supreme in the Bernese Highlands despite her modest namesake, her renown amongst the Swiss Alps second only to the Matterhorn. 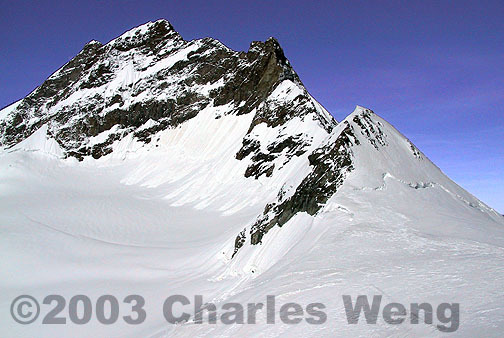 The white pyramid in the center of the photo above is the Silberhorn. In time, as the planet becomes ever warmer, it may keep its icy mantle only during winter. Thanks to Switzerland's hyper-developed infrastructure, a typical tourist can have the kind of close encounter with alpine peaks normally reserved for seasoned mountaineers. 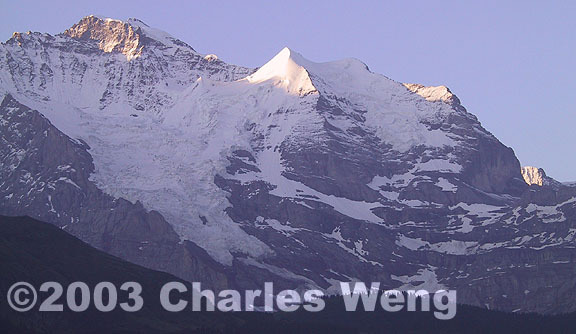 The above vantage point of the Jungfrau's 4158 meter (13721 ft) summit is a short snowy walk out of the Jungfraujoch observatory, which, at 3475 meter (10425 ft), is the highest train station in Europe. Here, the azure sky is of an intensity not usually experienced at lower altitudes. The air is fresh, but thin, and it is not unusual to see stalwart seniors walking with a compact oxygen tank in a stroller.